A poll reported in this morning's Wall St. Journal (subscription) indicated that more Americans are significantly affected by high gas prices than by rising food prices, falling home values, unemployment or foreclosures. That's a surprising result, considering that transportation fuel only accounts for about 5% of average household expenses. However, gasoline has one of the most visible prices in our society, and the scale of our fuel use is such that price increases of the recent magnitude aggregate to a very large total. 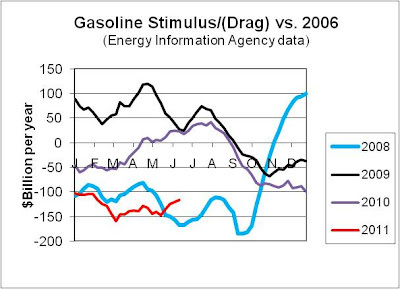 Based on year-to-date prices and compared to a more typical year like 2006, the drag on the US economy is running between $100 and $150 billion for 2011, reversing any "gasoline stimulus" we received in 2009. 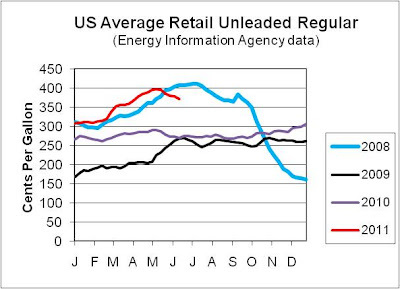 As of the latest price report from the Department of Energy's Energy Information Agency, the national average price for unleaded regular gasoline has dropped back to $3.71 per gallon from its May peak of just under $4. Despite that, it's still more than a buck higher than this time last year. In fact, until a couple of weeks ago gas prices were trending well above their path in 2008, when prices reached an all-time high of $4.11/gal. that July. (See above chart.) When I compared this year's prices to those in 2006, which averaged only about 20 cents per gallon lower than last year's but exhibited more normal seasonality, and then multiplied by the more than 137 billion gallons of gasoline the US is likely to consume this year, the total drag on the economy worked out to between $100 and $150 billion on a full-year basis. (See chart below.) If these prices persisted, that would be enough to negate the effect of the entire 2% cut in Social Security taxes for 2011. Fortunately, barring an escalation of the current supply disruptions in the Middle East, a major hurricane affecting Gulf Coast refinery operations, or an unexpected surge in economic growth, we've probably either already seen the peak gasoline price for the year or are within a few weeks of it. The outcome of last week's OPEC meeting, while not as bearish for prices as an agreement to increase quotas and output would have been, has had little lasting effect on oil prices, which are running at a level consistent with this week's US average pump price or a bit less. However, no one should confuse a seasonal easing in prices with a permanent return to cheaper gas. Short of another global economic crisis, global oil supply and demand remain closely enough matched that any hiccup will quickly translate into higher prices at the pump. I feel safe in predicting that we'll be flirting with $4 again before long, and the consequences of that should be factored into any forecasts of future economic growth.